^ Westenhöfer, M. Der Eigenweg des Menschen. Berlin: Mannstaedt & Co. 1942. ^ 2.0 2.1 Hardy, A. Was man more aquatic in the past (PDF). New Scientist. 1960, 7: 642–645. （原始内容 (pdf)存档于2009-03-26）. ^ Morris, Desmond. The Naked Ape. McGraw-Hill. 1967: 29. ISBN 0 09 948201 0. Morgan, Elaine. The Descent of Woman. Souvenir Press. 1972. ISBN 0 285 62700 7. Morgan, Elaine. The Aquatic Ape. Stein & Day Pub. 1982. ISBN 0-285-62509-8. Morgan, Elaine. The Scars of Evolution. Souvenir Press. 1990. ISBN 0-285-62996-4. Morgan, Elaine. The Descent of the child. Souvenir Press. 1994. ISBN 0-285-63377-5. Morgan, Elaine. The Aquatic Ape Hypothesis. Penguin. 1997. ISBN 0-285-63518-2. Morgan, Elaine. The Naked Darwinist. Eildon Press. 2008. ISBN 0-9525620-30. ^ Morgan, E. The Aquatic Ape. Stein & Day Pub. 1982. ISBN 0-285-62509-8. ^ 6.0 6.1 6.2 Morgan, Elaine. The Aquatic Ape Hypothesis. Souvenir Press. 1997. ISBN 0-285-63518-2. ^ 7.0 7.1 Niemitz C. A Theory on the Evolution of the Habitual Orthograde Human Bipedalism - The "Amphibisce Generalistheorie". Anthropologischer Anzeiger. 2002, 60: 3–66. ^ Patrick, John. Human Respiratory Adaptations for Swimming and Diving. Souvenir Press. 1991. ISBN 0-285-63033 4. ^ Langdon JH. Umbrella hypotheses and parsimony in human evolution: a critique of the Aquatic Ape Hypothesis. J. Hum. Evol. 1997, 33 (4): 479–94. PMID 9361254. doi:10.1006/jhev.1997.0146. ^ Odent M. We are All Water Babies. Celestial Arts. 1996. ISBN 0890877580. ^ Pawlowski B. Why are human newborns so big and fat?. Human Evolution. 1998, 13: N1. ^ Kingdon, Jonathan. Lowly origin: where, when, and why our ancestors first stood up. Princeton, N.J: Princeton University Press. 2003: 242. ISBN 0-691-05086-4. ^ Verhaegen M. Origin of hominid bipedalism. Nature. 1987, 325: 305–6. doi:10.1038/325305d0. ^ Crelin, Edmund S. The Human Vocal Tract: Anatomy, Function, Development, and Evolution. New York: Vantage Press. 1987. ISBN 0 533 06967 X. 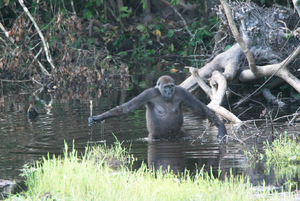 ^ Roede M. The aquatic ape: fact or fiction? : the first scientific evaluation of a controversial theory of human evolution. London: Souvenir Press. 1991: 99. ISBN 0-285-63033-4.